I know I’m not alone in feeling sad the WordPress Weekly Photo Challenges have come to an end. I’m not the most prolific blogger these days but this recurring event has been both my favorite online group activity and source of inspiration when my creative well is dry. Not only did the prompts push me to new exploration but reading the varied responses in real-time was another eye-opener, there are so many ways to interpret one small word or idea and this international community never failed to deliver fresh perspectives. Since the final prompt is All Time Favorites I went to my stats to find out your Photo Challenge favorite and was surprised to see the #1 post in both views and comments featured a photo that I re-worked and posted a second time just a few weeks ago. I guess it was a favorite of mine too and the opening quote is a perfect fit for today’s message. Libraries have always seemed like magical places to me and the freedom to walk aisles full of stories and information is a luxury I never take for granted. Through my childhood, school years and now as an adult materials I’ve borrowed have opened my eyes to new possibilities and points of view prompting even more questions and the reward of yet another trip to the library. 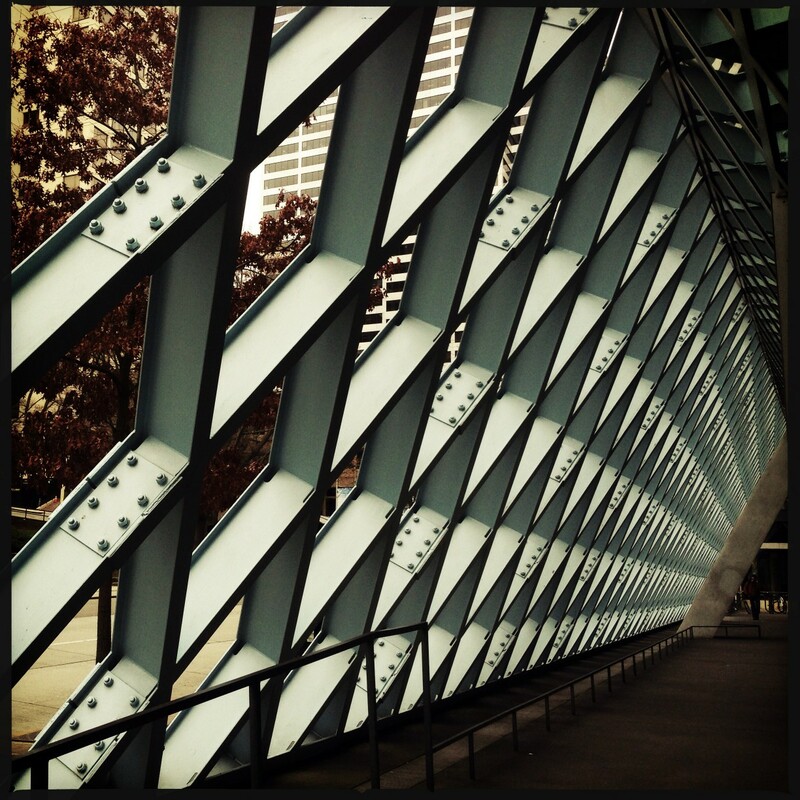 This exterior walkway around the Seattle Public Library is a popular place for photographers as well as a meeting space for Library patrons and pedestrians hoping to duck out of the rain on a spring afternoon and I’m posting it today as part of the Weekly Photo Challenge: Angular. Good-bye Weekly Photo Challenge, I promise I’ll keep my eyes open for new angles and situations. It’s a great photo to end with. All the times I’ve been to Seattle and I’ve never stopped at the library. I’ll have to change that next time! Glad you like the photo, Carrie. You’ll definitely have to stop by and see the library in person the next time you’re in the area! Love the shot, Lisa. I’ll miss the challenge as well. It was such a good way to meet other bloggers without having to follow all their blogs. Can’t take on any more blogs at this time. Happy to hear you like it, Su.